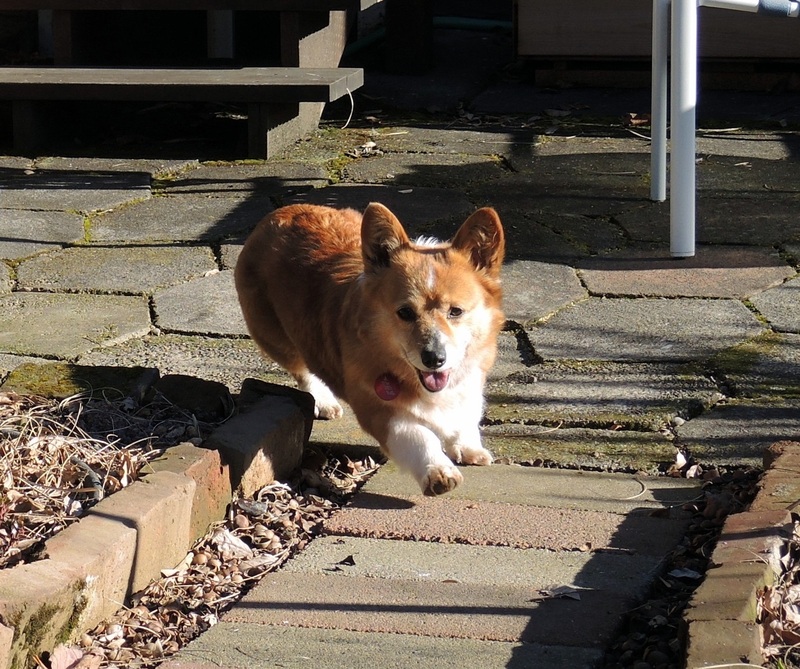 In January we adopted an undersize corgi in need of rescue. Cleo is the abridged version of this type of dog – instead of weighing in around 30 pounds, she only weighs 20. She’s so small that we thought she was not far beyond puppyhood, but our vet says she’s a senior citizen – 10 or 11. Cleo’s miniaturized frame works well for her because one of her back legs doesn’t work well at all. She probably has the same degenerative nerve condition that struck our last dog, Teddy. Her light weight makes it easier for her other legs to do most of the work. And they do! 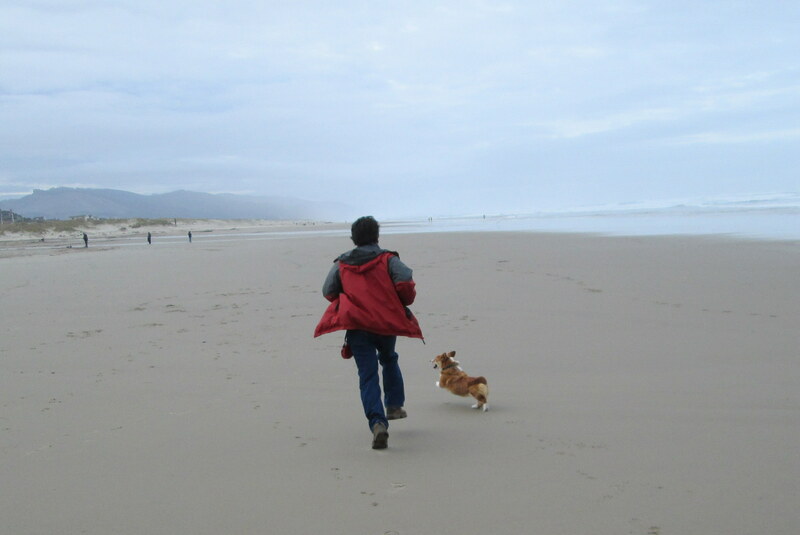 This dog streaks like a missile across lawns and beaches and through any open door. She can outrun me in a sprint but not in a marathon. It was when I saw her racing around the perimeter of the large grassy pen where she was being held that I knew I wanted to give this dog a chance. She has a rage to live. Cleo running looks from behind like a hook-and-ladder fire truck, except there’s no one steering on the back end. When she’s not charging into the forest to chase another squirrel or racing around the base of our quince bush scolding the chickadees and goldfinches that perch there, she’s happy to curl up and sleep. On the bed, on the couch, on a pile of towels. She loves everyone and expects them all to love her. When we walk her at Reed College, she elicits a cascade of ooohs from coeds that we call The Sopranos Effect. She doesn’t like being left out. She can’t handle stairs, so if I’m downstairs she comes to the landing at the top and makes clicking sounds like the primitive drumbeats in Battlestar Galactica. Run-DMSteve takes Cleo for an al fresco editorial conference. Yesterday we let her off the leash on a baseball field to play with another corgi. This other corgi owned a ball. It turns out that every ball Cleo sees belongs to her and she immediately transformed into Bilbo face-to-face with the Ring. The two dogs ran in circles, barking and snarling, with all of the humans shouting, which to dogs sounds like now we’re all barking. I cut off one of their circles (I haven’t owned herding dogs all these years without learning something) and tackled Cleo with a last-ditch slide. This is too much raging. I’ve put off writing about Cleo because frankly, given her age and what’s going on with her back leg, we don’t know how long she’s going to last. But she’s already become a valued team member here at the Bureau. She’s probably going to win Employee of the Month for March. It’s time I introduced her. Tomorrow: What I did on my mid-winter vacation! If The Beatles had stayed together, and if in the 1980s they got tired of listening to Simple Minds and Orchestral Maneuvers in the Dark and decided to record something hard and dark but closer to their rock ’n’ roll roots, they might’ve come up with something similar to this. The Smithereens are a solid band, though some of their songs do trudge along. If you like sad, they can deliver. “Beauty & Sadness” and “Only a Memory” touch the heart. “A Girl Like You” and “House We Use to Live in” rock so very hard. “Miles From Nowhere” borrows riffs from but none of the fun of The B-52s’ “Roam” and Duran Duran’s “Rio.” “Time Won’t Let Me” is a really bad cover. And now that I’ve twice put “Rio” in your head, let’s all enjoy one of the funniest videos of all time. Oh, to dress in a tailored suit and engage in lip synchronization on a sailboat! If only they could’ve worked this into All Is Lost. Congrats on the new addition! She may live a short life with you guys, but I bet it’ll be absolutely fabulous. I admire your courage in taking her in and letting her into your hearts. Thanks, guys, but it was easy decision. Now all we have to do is turn her into a revenue generator. I wuvvers her! Bless you both for taking her in!